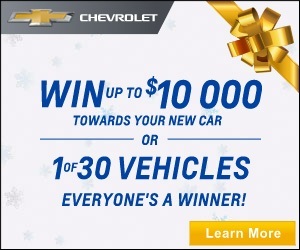 GM Sale Promotion: Win $1,000-$10,000 Off A New Car! Wallace Chevrolet > Contests > CONTEST ALERT: Connect & WIN at WallaceChev! GM SALE! CONTEST ALERT: Connect & WIN at WallaceChev! GM SALE! The end of the year is nearly upon us and to help ring in the new year we’ve decided to throw the biggest savings event of the year- Connect and Win! It’s a great GM sale and it’s on now until the end of the year. Simply drop by WallaceChev from Dec. 1- Jan. 4 and you could win one of 30 brand new GM vehicles (valued up to $35,000), or enter to win $1,000 to $10,000 in cash credits on your vehicle. It’s easy! There’s no purchase necessary and there’s no catch! Visit by WallaceChev and drop by our contest table and we’ll help you enter the draw using one of our iPads. That’s it! With a guarantee prize cash rebate of $1,000 or more it’s easier than ever to get into a brand new 2015 or 2016 GM vehicle. See you soon! today to enter! Thanks for playing!